To help get back into using design programs and such for course curriculum development, I thought I’d brush up with a brief site analysis. Going through this process will help me articulate what I’ve learned over the past year about Lillklobb and hopefully I’ll learn a few new tricks with the programs to make content more interesting (so bear with these early versions of diagrams and such). The practical purpose of this exercise isn’t so much to reveal anything new about the land to myself as I’ve been building my “internal” site analysis over the past year of visits and interaction with Lillklobb- instead the idea is to provide the kind of orientation material that other people will find useful. Site analysis is foundational work: whether it is done quickly on pen and paper or kept in your head, it is a critical stage in any project. In permaculture design, we use it as the framework in which we slot the results of our investigation into a plethora of phenomenon that help characterize a site. I like to use the site analysis framework provided by Dave Jacke and Eric Toensmeier in their seminal, two volume Edible Forest Gardens. One starts by examining the site’s context from afar, working one’s way closer to the site’s details (the permaculture principal of “pattern to detail” even applies to how one structures the process itself). This could be called forming a “low resolution image” to try grasping the whole before building higher resolution images of the parts you’ll actually be able to change. With that in mind, this first post with “Global, Regional, and Local Context” for Lillklobb may seem a bit obtuse. It isn’t where one goes to look for real inspiration for design specifics or problem resolution. It is the stage upon which the rest of the design process will take place. As such, it serves to orient those with less knowledge of a site so that they know the basic vocabulary one needs to properly interact and digest the remainder of a design document. Note: if you’d like me to discuss these more through audio/screencast recordings, let me know as there is a lot more that doesn’t make the cut. The city of Espoo is located on the southern coast of Finland about halfway between the western coast and eastern border at 60°12’N 024°39’E. It is the second largest city and municipality in the country and perhaps the most wealthy. Situated directly west of Helsinki, the capital, it is an integral part of the Helsinki Capital Region where 1/5 Finns resides and the majority of the GDP is generated. Finland has some of the highest “development” ratings anywhere in the world, with a relatively wealthy population, low inequality, and a broad social safety net common to Nordic countries. Finns pay particular attention to their environment and are acutely aware of climate change. This combination of culture and wealth concentration creates demand for environmentally responsible products and services. In fact, Finland is looking to its knowledge of environmental stewardship knowledge as a primary export in the global information economy. Espoo is located at the southern and easternmost edge of mixed forests in Finland. As it happens, this is the most northeastern place these mixed forests are found in Europe with any regularity. Travel much further inland and the landscape becomes taiga. 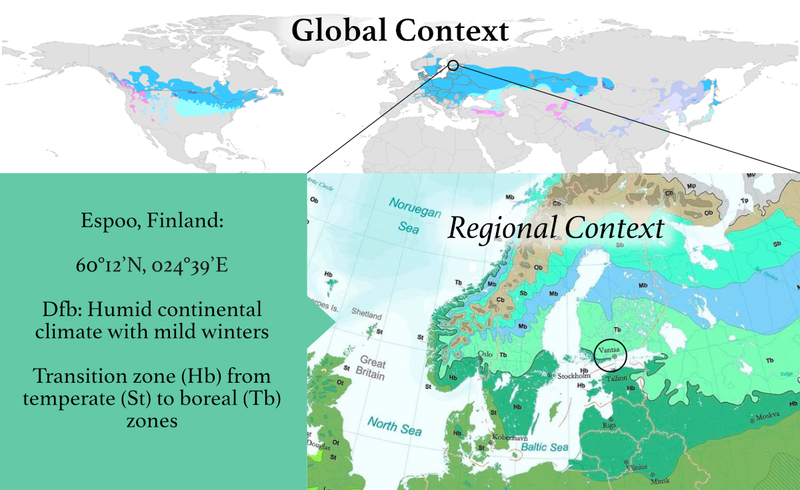 In terms of climate, this area of Finland is classified as continental (Köppen Dfb): winter temperatures can drop to -30C on occasion, but usually dip around -25C at the extreme. On the other hand, summers are typically mild but can venture into warm spells as seen most recently in 2008-2009. Close proximity to the Baltic Sea means that the weather is highly variable and windy (also due to our position so far north). The growing season (above 10C) begins in May and extends into early October, with an average of 90 frost free days. This area experiences 655-685mm of unevenly distributed precipitation. The driest months occur from February-May, when the area receives about half the precipitation as the rest of the year. October is usually the wettest month, with up to 1/3 more rain than the summer months. The greatest limiting factor in plant growth is the highly variable temperature which can dip below freezing even towards the end of June, so utmost care must be provided to defend crops against frost throughout the year. Finland’s state meteorological institute provides satisfactory forecasting, although accurate hyperlocal radar is nonexistent. This is mostly due to the lack of “extreme” weather in Finland: strong storms are rare and the threat of cyclones, tornadoes, and other natural disasters is one of the lowest on the planet, so investing in these systems is not a high priority for the state. 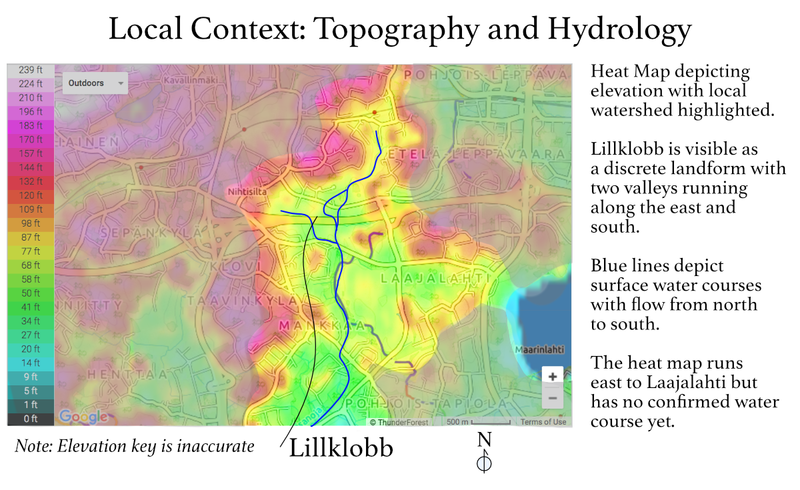 The accompanying heat map depicts the local watershed. The local neighborhood’s character is marked by the presence of an area of high elevation to the north that extends around to the west and south. Although topographically distinct from that feature, the area of South (Etelä) Leppävaara constitutes the eastern boundary of this watershed, more or less. Lillklobb is visible as a minor hillock well within what constitutes a significant valley. Prevailing warm winds for our region arrive from the southwest where they are buffered or disrupted by the hills in the Nihtisilta and Taavinkylä areas. However, the main Turku-Helsinki highway (national highway 1/ European route E18) splits these two hills creating a corridor for wind, though the presence of a large overpass there further disrupts the flow of air. Because Lillklobb sits in the valley bottom, the larger hills and ridges to the north also help protect the site from strong north winds. Combined with site specific landform and vegetation, Lillklobb is rather “still” for such a windy place as Finland. The streams indicate an abundance of groundwater water. Although both the streams that run alongside the property are small, as year-round surface water features they are vulnerable to pollution. Given the poor environmental state of the Baltic Sea (2.5km east, 5km south), it is important to not contribute to the problem. The property is in a highly urbanized area with a strong mix of light industrial (which is partly to be phased out), office spaces, residential zones, and green space within a few square kilometers. Immediately to the south is one of the busiest highways in Finland linking Helsinki and Turku (aforementioned national highway 1/European route E18). A roughly 30m strip of land separates the two. The existence of the Turku highway and close by interchanges with Ring 2 to the west and Ring 1 to the east have an unmistakable negative influence on the property’s soundscape. More on this in the sections regarding access and aesthetics (coming in part 2 of this blog series). However, the presence of a strong road network also allows for rapid, reliable transportation throughout Finland from the site. During low traffic hours, a trip to the center of Helsinki only takes about 15-20 minutes by car. To the west of of the property is a light industrial complex that was built in the 1970’s. The complex’s highest points are low in comparison to the hill, presenting little negative consequences for site development. On the contrary, its large size means that no trees can grow to create shade in the future. It may also prove useful for gathering of scrap material or even rainwater collection from the large roofs. Related to offsite input potential is the presence of the largest recycling center in the area which processes donations of furniture, clothing, plumbing materials, and other useful things for potential use in site development. There is a significant amount of green space around the property, though Lillklobb sits at the far southwestern end of this green zone, so the ecological benefits are hard to quantify. 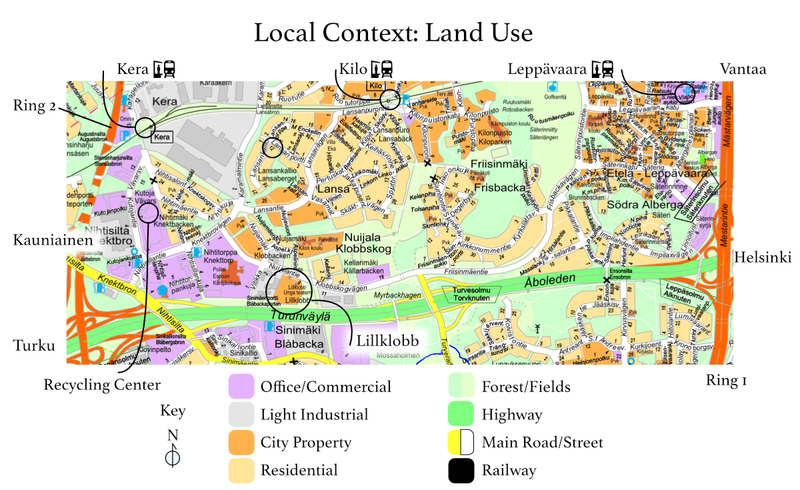 The property adjacent to the east is also included in the cultural protection of Lillklobb and is managed by the Parks Department of Espoo as “Lillklobb Park.” This park is largely in name only as the area is only mowed periodically and people generally use the park across the street. High voltage power lines transit the park north/south to a substation across the street to the northwest and then continue to the north east along the greenway. I’ve included the railway that links Helsinki to Turku that also provides frequent local service. Kera station is about 1.6km to the north and Kilo station is about the same distance as well: both stations are suitable for visitors to Lillklobb. Leppävaara station has also been included as it is Espoo’s main stop for regional and distance trains, as well as serving as an important public transport hub for Espoo-Helsinki-Vantaa routes. A new overpass between the two Ring roads may bring more traffic than before to the area, but could also take some pressure off existing systems as well. It currently does not have onramps for westbound traffic or exit ramps for eastbound traffic. Still, when Ring 1’s road work is completed, this new link may decrease transit times to and from Helsinki for deliveries and other work. Note: the new overpass and connection to the east-west highway has been completed since this image was taken. 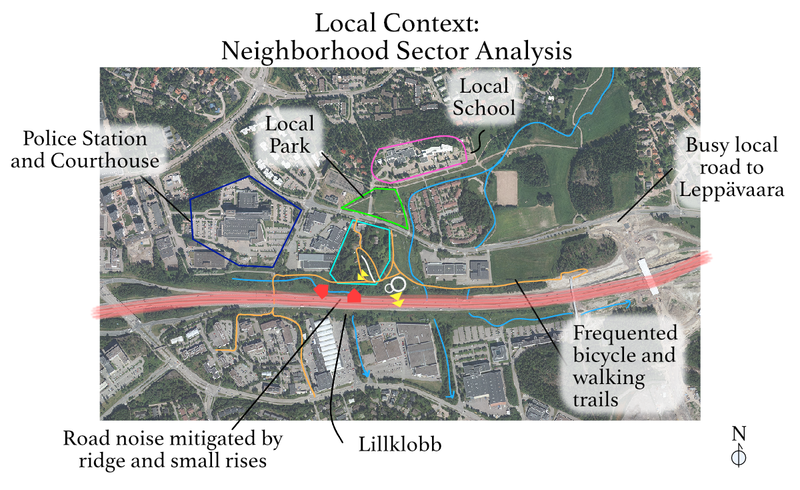 This next analysis provides a slightly closer look at Lillklobb’s neighborhood. Using satellite imagery this time from Google and Espoo City, one can see how Lillklobb stands out as the last green island before intense development to the west and south. The most important factors to keep in mind are the highway noise and presence of established bicycle & pedestrian routes which transverse the site, linking to the wider network of non-motovehicle transport infrastructure in the region. Highway noise is a constant issue, although the actual level fluctuates with season and time of day. Due to its close proximity and landform, traffic noise on the western boundary of the property is quite loud because the land gently slopes upward, allowing the sound to travel unimpeded. There is not enough distance between the site and the highway for enough forest or vegetation to make a significant reduction in the noise level. However, the eastern side of the property is relatively quiet in comparison because the ridge of the hill protects those eastern slopes and there are two low hills closer to the highway which deflect some sound. More on the soundscape later in part 2. Less than 100 meters to the southwest is a pedestrian/bicycle underpass giving access to the police/court complex there. Trails lead from this maintained, paved route to Lillklobb and beyond to the east where a new pedestrian/bicycle overpass was built this past year. These trails lead to the rest of the Helsinki area, in particular Leppävaara which is a transport hub. To the east of the property are also maintained dirt roads used by city and other groups vehicles to maintain infrastructure. These are natural walking paths for local residents as well as police K-9 units. It should be noted that these dirt roads are expected to expand to the west just outside the southern boundary of the property in the city’s master plan. More on this in the site specific analysis of Access & Circulation. Although the highway’s noise discourages a lot of active use of the site by local people, there is a fair amount of traffic throughout the day, especially local dog owners. Other neighborhood features include the maintained park to the north of the property and the school which abuts it. There are often young school age children spending time around the old barn (which is a theater now) after school hours, though I have rarely seen them venture further into the property.